Styled like your favorite jeans, with several special features like- front utility pockets and back patch pockets, belt loops, vertical slits, hits at mid-thigh and many more. They are designed to impress anyone who look at the miniskirts. Perfect for parties, dinners or outings. Available at various price range. 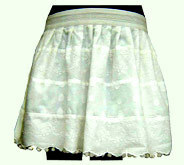 Desc : Developed keeping into mind the image of fashionable girls & ladies, our ladies mini skirts lend a distinctive look to the wearers in the crowd. Desc : Light in weight yet durable in quality. 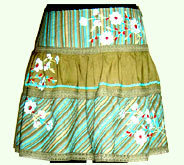 Blue & golden color stripes and white & red color flowers elegantly embellish these stylish women's mini skirts. Desc : Redefining the fashion and beauty in an innovative manner, ladies short skirts having enchanting frills can be worn with tops, shirts and other western outfits. Desc : Ideal to earn a place in the heart of sweetheart. 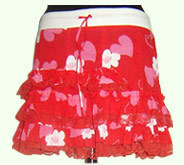 Pink heart designs & white floral motifs are made on these red colored designer mini skirts having frills. Desc : A pleasure to both users and viewers. 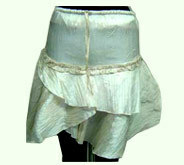 Pocket mini skirts have been glamorized with delightful shades of white and green. They are furnished with pockets to keep small items. 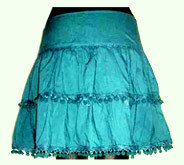 Desc : To mesmerize the onlookers with incomparable designs these pleated mini skirts are purchasable. 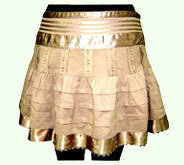 These mini skirts are adorned with yellow frills on sparkling golden fabric.